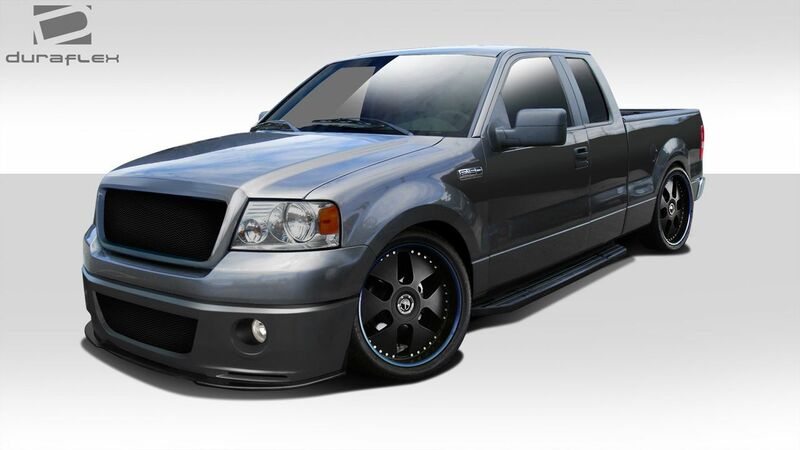 Looking for a Ford F150 Body kit? Look no further than our 2004-2008 Ford F150 body kit catalog. We offer a full selection of body kits, hoods, fenders and more. Weather you are building a lowered street truck or a lifted off road rig we offer parts that you will like. The staff at Driven By Style has over 10 years of experience selling Duraflex brand products. We know the product line inside and out and can answer any questions you may have. Additionally our pricing is guaranteed to be the lowest or we will match or beat any competitor. Our most popular body kit for the 2004-2008 F150 is the super snake style. Styled after the limited edition trucks that Shelby put out you can now have that look on your F150. The super snake body kit consists of a front bumper cover replacement, lower front lip and optional hood and front grille. When it comes to shopping for a custom hood for your 2004-2008 F150 look no further. We offer 10 unique styles of lightweight fiberglass hoods and 5 ultra light carbon fiber hoods. Our F150 hoods provide more than just styling. The cowl design hoods add more clearance in the engine bay while the vented designs aid in cooling. The more cool air you can get into the engine bay and the easier you make it for the hot air to escape the better. One of the most popular upgrades with owners that want to build a really special F150 is our bulge series fenders and bed sides. Add up to 4.5″ of additional clearance for bigger tires and articulating suspension for off road dominance.